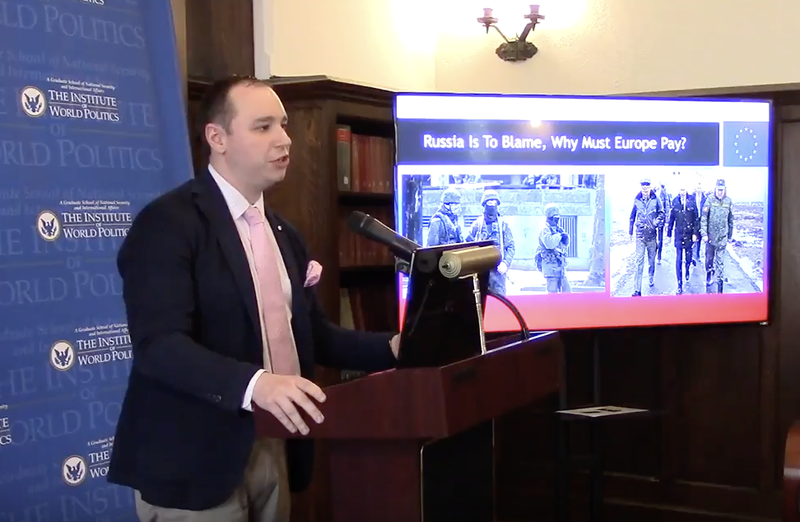 On April 17th, IWP alumnus Brandon Weichert, a former Congressional staffer and founder of the geopolitical bespoke and analysis company, The Weichert Report, spoke to IWP on Russia and its geopolitics. Mr. Weichert’s main argument was that America should firm up its troop commitments to Eastern Europe as an independent force, promote capable and coherent European groupings to arise and challenge Russia against further military action by developing abilities on that same spectrum, and ease or altogether do away with the sanctions regime against the country. American sanctions, Mr. Weichert argued, are achieving few of its aims while placing a great burden on neighboring European economies in terms of lost trade opportunities with Russia. But more to the point, Mr. Weichert reminded his audience, the consequences have not matched original goals. Instead, sanctions have placed either pressure on Russia to collapse, or they have been and will continue to be a source of stubborn allegiance to Putin’s bellicosity. Neither outcome is desirable for American interests. An alternative to economic meddling in the region needs to convince on another spectrum, to firmly channel Russian adventurism in its natural, eastern direction. Mr. Weichert said that as a neo-Eurasianist, Mr. Putin ultimately can have more important things to consider than avoiding an attempted economic thrust to the jugular from Europe and America. Instead, send Russia a firm message of military resolve and allow it the profits of its global trade (and let these moderate its actions), said Mr. Weichert. The result, he predicted, would be shifting Russia’s focus to the lowest hanging fruits, first in Europe with economic reintegration, then in Eurasia, with geostrategic development. In this last move, Mr. Weichert alluded to the challenges that this would pose for China, and of the interest America would have in facilitating maneuvering between the two powers. Next Au Revoir, France! Macron’s Victory Is France’s Loss.